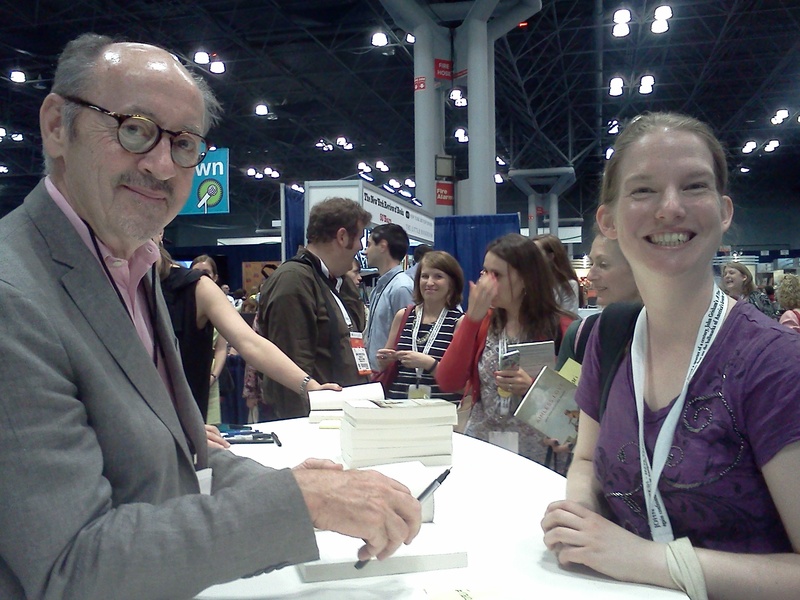 BEA Day 2: I Met Billy Collins! Today, I met Billy Collins and he signed his latest volume of poetry for me. He could not have been nicer or more gracious. He asked the name of each person whose book he signed, and shared a couple of words with them, never enough to hold up the long line, but enough just to be very nice, asking things like where people had come from, or what brought them to the Book Expo. I was able to restrain myself from gushing like an incoherent fangirl. I gushed in basically complete sentences, about the fact that I admired his poetry, and that I am a library science student, and a poet myself. I even got him to take a picture and shake my hand before floating away, walking on air. There was more Book Expo after that. And it was quite nice. Though my day started on the later side– I had trouble getting myself launched this morning, missing a Twitter panel I’d been eyeing, as well as a Book Club Speed Dating event that was full of more tantalizing galleys. I’m not sure which list is longer at this point, the growing pile of books I’ve managed to come home with, or the books that I’m hearing about, and yearning for, but haven’t acquired yet. And then we found Hillary, and roved the exhibit floor a bit. One more day left, and I can’t imagine how it will top today. When am I going to read all these books? I do not know who Billy Collins is but I can imagine it must have been a pure joy to meet one of your favorite poets. Your face lit up when he signed your copy. I am like that when I go to a Jackie Collins book reading and signing. I totally get it and dig it.